Global: How to contribute to the provision of safe, nutritious food in sufficient quantity and quality to urban populations, given population increase and no more land, eroding soils and huge pressures on water and energy supplies. Local: How to reduce the whopping bill (£0.90 for every £1 spend) of the dietary effects of the food system — especially pertinent as most of the profits from our spend leave the city, but most of the £0.90/£1 cost is locally borne. As shown in the slides, our response here in Birmingham will use VAT as a useful metric, as can responses by other cities and towns across the UK. Inevitably local NHS bosses and other socio-political decision-makers are interested in the latter consideration — the costs of the dietary effects of the food system. 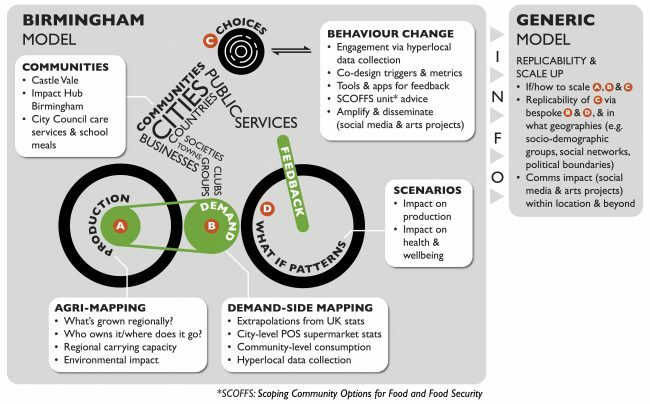 What motivates the communities we’re talking to, however, is the altruistic challenge of the contribution the city can make towards global food resilience and sustainability (see slide 7) — which is arguably far more important, if seemingly less urgent for us here in the UK. Brilliant graphic summary? All credit to Oliver Tomlinson of TDL Creative who created this ever-so informative “bike” info-graphic. note: See also pp74-83 of this report by the House of Lords Select Committee on the Long-term Sustainability of the NHS and Adult Social Care, published yesterday.